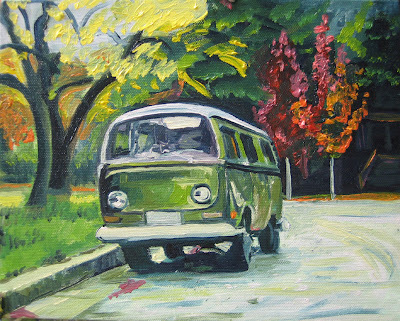 "Lynda's Green Bus" 8" x 10"
Today, I started this commission. A woman was reminded of driving her children around on the East Coast in her pea green VW Bus in the 70's when she saw my first painting "Blue Bus on Mariposa". She asked if I could make her the same painting to give as a gift, but with a green bus instead of a blue bus. I hope to finish this tonight in a second session of more detailed work. This took about 3 hours painting time, and a prior hour of photo manipulation and printing from Photoshop. I love your drawing!! It's beautiul, I own a 1978 bus. 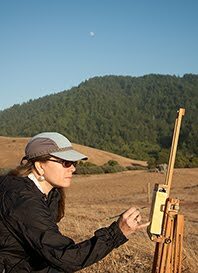 Do you sell your drawings?